Where to start? We spent a morning through mid-afternoon under beautiful sunny skies in Greenport Village, enjoying a taste of Greenport and the North Fork. We all know a picture is worth 1000 words, so I’ll go photo-heavy and text-light in this post. To begin, we took ferries over from East Hampton to get to Greenport early. We visited Kessie, a Main St. Greenport shop full of great clothing and accessories. Marian finished her Hanukkah shopping and Linda Kessler, proprietress of Kessie, pointed us in the right direction for the Taste experience. OK, we were on our way. The action began in a tent set up by Greenport harbor, just off Main St., right near the carousel. You couldn’t miss it, but we did at first. No worries, the huge white thing flapping in the steady breeze was our destination. You can see the carousel and the tent in the photos following. What was in the Tent? A wide variety of vendors offering unique products from our beautiful North Fork. Mushrooms? Yes! Potato Chips? Yes! Moroccan Spice Dip? Yes! Chocolates to go with wine? Yes! We walked around and tasted and enjoyed. 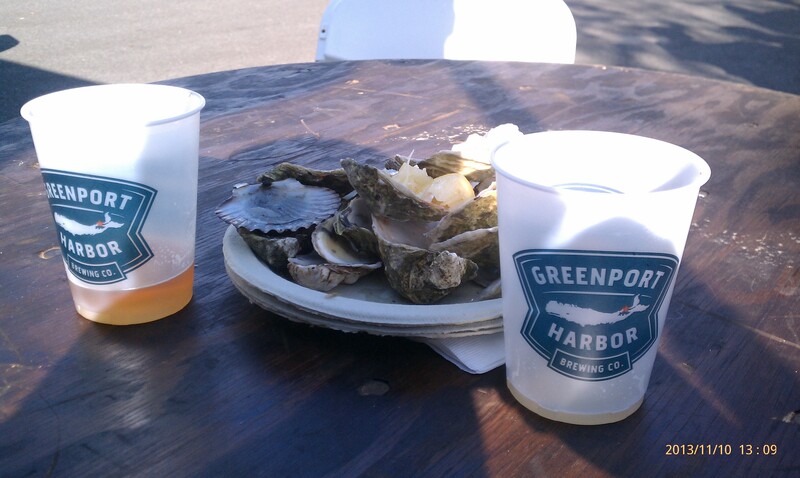 When we first heard about this Greenport party, the folks at the Greenport Harbor Brewery mentioned an Oyster-fest. Who could resist that? Well, not us. So, we scouted out the oyster feed, and found it in the Chase Bank parking lot. The loudest band in the region set up and began playing 1980’s favorites (White Wedding, for example) and it was just right for the unfolding scene. Beer from the brewery flowed from a vintage firetruck converted to this purpose. The oysters were fabulous! Marian and I had plate after plate. It was “two shells up!” The photo gallery tells the story. Every oyster vendor offered an excellent product. Comparisons are odious, but we voted with our palates for Mystic Oysters! Enjoy! Yes, all good things must come to an end. By 2:00 pm we had eaten our fill of oysters and drunk our fill of beer. Meanwhile, the sun was covered in clouds and the wind had picked up. We decided to decamp, take a ride out to Orient Point, and then catch the ferries back to East Hampton. Don’t worry, there will be another iteration of this festival December 7th, or thereabouts. Who knows what the fall holds? We saw a great looking restaurant called First and North. They have wine flowing on tap. You can bet we’ll be trying it soon, and telling you all about it. Until then… enjoy your trip around town!